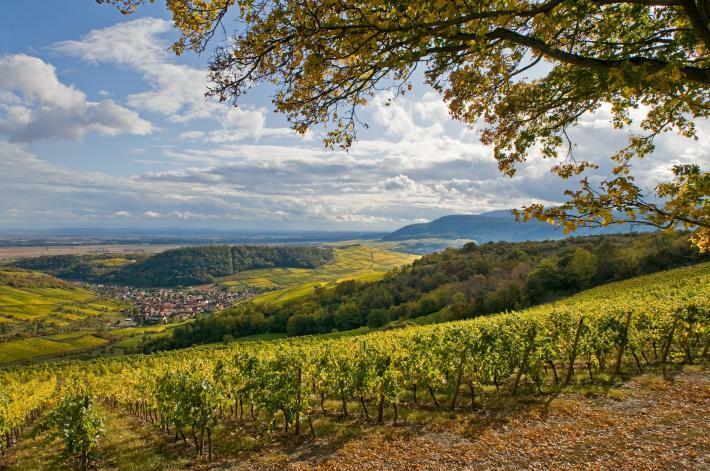 The Alsace wine-growing area, sheltered from oceanic influences by the Vosges mountain range and with one of the lowest rainfalls in France (500 to 600 mm of water annually), has a semi-continental climate which is sunny, warm and dry. The terroir imprint bestows extra character and soul to Alsace wines . The natural barrier of the Vosges protects the vineyards and contributes to the very Alsace-specific climate. On one hand it limits the oceanic influences and accentuates the climate continentality (very hot summers and cold winters). The degree of temperatures favourable to vines (above 10°C during the growing season) are therefore reinforced. On the other hand, the strong winds from the west give abundant rainfall on the western slopes of the Vosges which become dry winds upon arriving on the vineyards. The low amount of annual rain, an average of between 600 and 650 mm, reduces the risks of rots and thus allows for less vineyard treatment. Finally, the Alsace climate is distinct due to the alternation of hot days and chilly night during the autumn, perfect conditions for slow and extended grape ripening. This privileges the development of complex aromas and maintains a ripe acidity which provides freshness to wines. The history of this wine-growing region boasts both Germanic and Roman influences. A culture led from the beginning of our era by the Romans, then revived by the Merovingian and Carolingian dynasties. Before the end of the first millennium, 160 Alsace localities were farming vineyards and during the Middle Ages, the Alsace wines were considered among the most prestigious in Europe. Secular traditions which are presently combined with cultural practices, proximity, and loyalty to all soils and grape varieties with a deep respect for the land. The extreme diversity of the soils, sub-soils and micro-climates have led Alsace producers to preserve a large range of varieties, thus favouring plant biodiversity and giving all the selected varieties the best conditions for optimum development. The Alsace wine-making tradition is based on seven major grape varieties which gives these Vins d’Alsace their names and aromatic character. Both in the vineyards and wine-cellars, Alsace know-how aims to preserve freshness and aromatic expression in the wines. Of particular interest is how vine foliage on trellises is trained to grow high off the ground which limits potential frost-damage and encourages sun exposure, or the grass cover technique which facilitates water retention and curbs erosion, notably on the hillsides. In order to fully understand the terroir, wine-growers know this means undertaking a genuine partnership with nature. Stimulate natural vine defenses, boost deep rooting systems or limiting the use of chemical inputs: in Alsace organic farming, sustainable farming or biodynamic farming are all common practices. Supervised by rigorous production rules, this know-how gives the Vins d’Alsace their identity. In wanting to be authentic, AOCs have imposed their constraints at various degrees depending on the terroir-specific expression level desired.